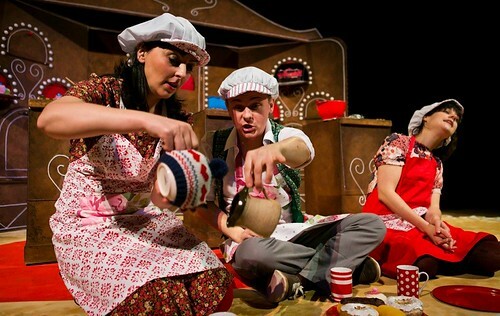 Care and attention to the details make Grinagog Theatre’s magnificent little production something very special as it flits into the Scottish Storytelling Centre for just four shows in two days. The Edibles are a trio of cooks who live in a gingerbread house kitchen, from where they bake cakes and sell the beautiful creations. To customers who, it seems, bear more than a passing resemblance to the chefs themselves. There is no great message here, just a real sense of fun in a piece which is perfectly pitched for three and four year-olds – but which will fascinate younger children and still engage with the funny bone of children up to six or even seven, so long as they don’t take themselves too seriously yet. The three performers, Clare McGarry, Becki Gerrard, and Alasdair Hankinson, create subtly different characters for themselves. McGarry as the tallest, just a shade more in control, Gerrard bouncing around and always up for fun and Hankinson just over stretching himself a tad. 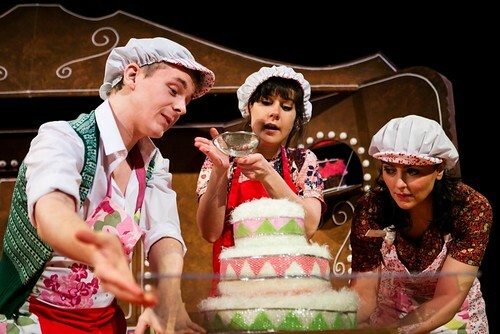 With these barely perceptible nods to a family relationship creating a bond between the characters and with their audience, they go on to produce a beautifully crafted tumbling comedy and playful humour, as the three explore their kitchen, create cakes and stand guard, in case of the dreaded mouse. On one level this appears to be little more than partially organised play -until you notice just how precise the timing of everything is. Some of Oliver Searle’s music cues can be triggered from the lighting box, others can only be hit if the seeming chaos is choreographed to perfection. Thanks to crisp and understanding direction from Bill Wright – who also provides dramaturgy – there is plenty of the latter on display here. And if you look at the way he has brought everything together, there is not one miss-spent movement. There is a story too, once the show settle it settles into its groove. A tale which involves the baking of an order which arrives by post one day for a massive three-tier cake. And the not so wee mouse who comes to steal it while it is still cooling from the oven. Designer Ali Maclaurin must have had a ball designing all the cakes and the surrounding gingerbread house. It is design which, although on a completely different scale, rivals Scottish Ballet’s concoctions for their Hansel & Gretel in scrumptiousness. It doesn’t end there, either. The company’s understanding of manipulation makes the puppet mouse, when it does arrive, something which will make those with a true fear of mice want to stay away. While providing one of this Christmas’s most enduring images as a plateful of pastries are arranged in mid-air to create the most elastic of faces. Scotland has some of the best companies making theatre for children in the world. On this showing, Grinagog Theatre are among them. Monday 23 – Tuesday 24 December 2014.